W.W.F.I.M. 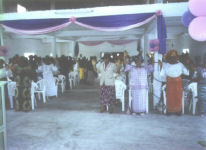 is a ministry which reaches out to women across Nigeria and abroad who come from various denominations and walks of life. This ministry seeks to release women from destructive cultural bondages such as female genital mutilation, forced mariages at an early age, the demeaning of women and illiteracy. W.W.F.M. provides one-on-one counseling to women and young girls who have been abandoned in the city and to single and married women in the urban an rural areas. Ministry activities include hosting conferences, seminars, revivals and intercessory prayer.